( because it bears the weight ). 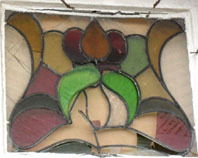 In these cases we can repair just this section , and rejoin it to the main body of the Window . When we get a Panel back to the Studio , the first part of the process is to remove the Lead from the Glass , this is sometimes quite a skilled job as care must be taken not to damage the Glass further. Attention must be paid to the arrangement of the pieces , as we have no template to indicate which piece goes where . The fragments of the broken sections are assembled to use as a guide, from which we will cut a new piece of Glass directly over the top . 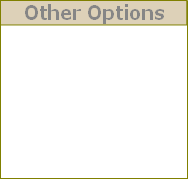 If only a few fragments remain , or they are entirely missing , then corresponding pieces may be used as a template . This approach is best suited to geometrical designs. 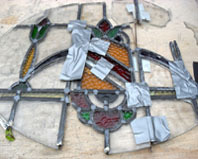 Once all the Glass is cut , then the whole panel will be leaded together in the traditional method . Hopefully the new Glass Panel will be the same size as the old one ! We have seen in our time some terrible repair attempts , not even delaying the inevitable . It is worth bearing in mind that the longer a damaged Glass Panel is left , it runs the risk of further damage , possibly costing you even more . Once the Leads have buckled they will only get worse . If the Windows are in the front Door , they may also be a security risk . Often Property owner’s refrain from having these necessary repairs undertaken , due to perceived high cost , through us, this is not the case . 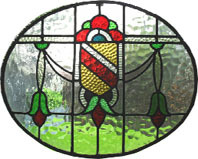 We will endeavour to match the colour , texture and shade of the Glass to your original as faithfully as possible . 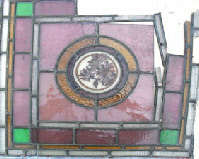 We stock a range of old pieces of Glass , so are quite confident that we will be able to make a repair that will go un noticed , even by the most critical of eyes . Also there is available commercially a large selection of Glass that is manufactured to match old styles of float Glass .